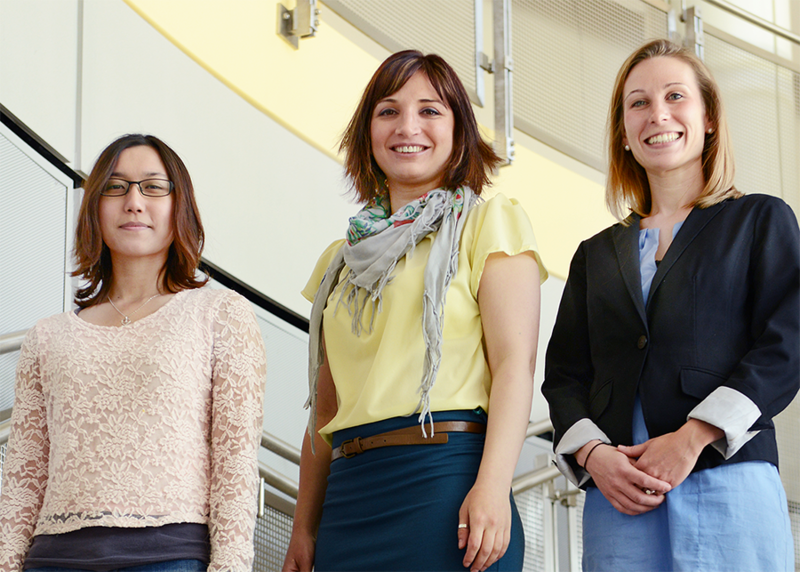 Three University of Maryland (UMD) Aerospace Engineering graduate students have been awarded Amelia Earhart Fellowships by Zonta International. Camli Badrya, Elaine Petro and Elena Shrestha were three of 35 women selected globally to receive the fellowship. Zonta International's Amelia Earhart Fellowships support women pursuing doctoral degrees in aerospace-related sciences and provides a $10,000 stipend to cover study and research-related expenses. Badrya is currently pursuing her Ph.D. under the mentorship of Professor James Baeder with a research focus on investigating flow at low Reynolds number numerically using computational fluid dynamics to solve the Navier-stokes equations. She and her colleagues are looking at very small scale of flappers, such as insect wings, which rely on highly unsteady phenomena to fly and differ from conventional aerodynamic flyers. As part of their research, they are using an in-house CFD (Computational Fluid Dynamics) code, OVERTURNS, developed by Baeder and his team. It provides a three dimensional computational platform for simulating flow fields around complicated rotating vehicles, such as helicopter and wind turbine rotors; as well as vehicles with flapping kinematics similar to birds and insects. Born and raised in Daliet el-Carmel in Israel, Badrya received her B.Sc. from the Technion, Israel Institute of Technology before coming to Maryland in 2011 as a Fulbright Scholar to complete her master's degree in Aerospace Engineering. "At some point it is also very important for me to return to my home country and act as a mentor to young women looking to pursue careers and education in STEM fields," Badrya said. After graduation, she wants to continue enhancing her knowledge and expanding her experiences by continuing research in either industry or academia. Petro, who also received a 2014 National Sciences Foundation Fellowship, is currently pursuing her Ph.D. under the guidance of Keystone Associate Professor Raymond Sedwick. She returned to Maryland in 2013 after working three years for NASA Goddard Space Flight Center as a full-time engineer. She currently works in the Space Power and Propulsion Laboratory investigating the feasibility of replacing traditional propellants for a helicon thruster with water vapor. Water vapor is an ideal propellant because it is very easily storable and plentiful throughout the solar system for refueling. She is also designing an ion acceleration stage to elevate helicon thruster performance to be competitive with the state of the art in electric propulsion. "I am extremely grateful for being named an Amelia Earhart fellow," Petro said, "It is an honor to be selected among so many other accomplished current and former fellows and to be a part of an organization dedicated to improving the lives of women in many different ways around the world." Petro is the first member in her family to pursue a doctoral degree, and she says that the encouragement and support from an organization such as Zonta is invaluable to helping her achieve her goals. For Shrestha, early trips to NASA and participating in FIRST Robotics during high school fired-up her interest robotics and flight. "To me, Aerospace Engineering fulfilled my interest in robotics and fascination with flight," Shrestha says. Since coming to Maryland as an undergrad in 2008, Shrestha has become a dedicated engineer exploring the development of the cyclocopter, a revolutionary cycloidal rotor micro-air vehicle (MAV), and in 2011, the rotorcraft community recognized her work with an American Helicopter Society International Vertical Flight Foundation Undergraduate Scholarship. She has spent her time in the Alfred Gessow Rotorcraft Center (AGRC), where her research experience as an undergraduate led to a journal publication, three professional conference publications and first place at the 2012 AIAA region I-MA student conference in the undergraduate category. She has interned with Si­korsky Aircraft Corporation, and began graduate studies at UMD fall of 2012 under the guidance of AGRC Director and Distinguished Professor Inderjit Chopra and Moble Benedict. Most recently, she also received a 2015 National Sciences Foundation Fellowship. Her cyclocopter uses a circular array of blades that rotate around a vertical axis, giving the cyclocopter performance and efficiency advantages over conventional rotorcraft at MAV scales. The rotor configuration allows its thrust to be instantaneously vectored, affording improved maneuverability over conventional rotors. Although the concept existed since the early 20th century, the cyclocopter MAV was the first cycloidal rotor vehicle to achieve stable hover and forward flight as a result of her research efforts. "I think that it is a very exciting time to be working on UAVs," Shrestha says. "Especially with such a novel concept like the cyclocopter, which has the potential to revolutionize the field of rotary-based UAVs." Established in 1938, Zonta International created the Amelia Earhart Fellowship as a living memorial to Zonta International member and aviatrix Amelia Earhart and to encourage women to expand their career options beyond traditional boundaries.